I’d like to have this in and out of the hand quilting frame. I have it taped to the floor tonight so I can mark the quilting lines, and I’ll load it this weekend. No Prob, right? 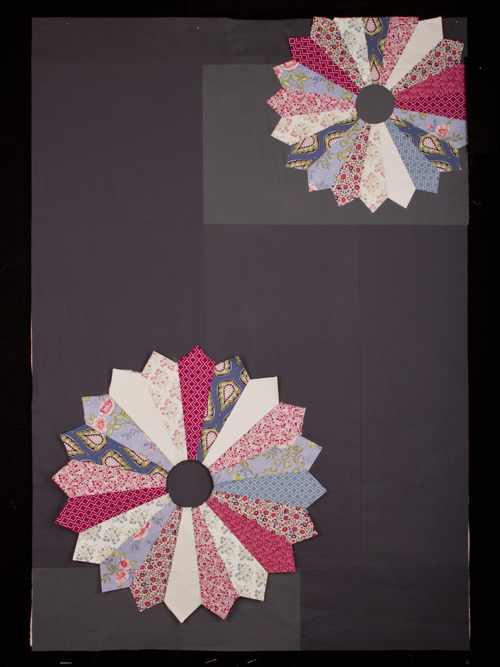 Love how your “dark” dresden plate quilt looks, so rich with the colors in your fabrics. Can’t wait to see how you quilt it. I’d love to see a picture of the quilting frame you use for your hand quilting. I’ve actually got a small inclination to hand quilt myself, but haven’t done a single thing to find out anything about the process. Not in the market for a doll carrier, but that little quilt with it is so sweet. Thanks Carolyn. I am excited to quilt this one. I’m doing vertical lines on the charcoal with a lighter thread which I think may look like a pinstripe suit and I am debating a pebble- sort of thing for the flowers. I love my quilting frame and I will take some pics as I load the quilt. If you want to hand quilt I highly recommend getting a frame; it cuts down on so much wasted time- no basting, no moving the hoop a billion times. You are probably pretty far from me but if you ever want to come over and see it I would love to show it off. See you soon! I was thinking the same thing a while back, what does your standing quilt frame look like? Where did you get it and how is it situated… Love theses commitments to get some quilting projects done and I hope it helps spur you along to your lovely goals. I love that baby doll quilt so sweet and light. 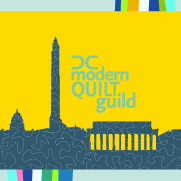 I should put up a “how I quilt” tab on my site- I think I will, thank you guys for asking about it! For now, it’s a Grace Z44 and it has changed my (quilty) life! It moves about the house but right now it’s kind of between the front hall and my computer area- drat these “open floor plan” houses with no doors any where! 🙂 My husband was saying just today how nice it would look in the basement… Thanks for the comment, Frederick! I had a rather hard time cnhsoiog just one type of physician I would want to work for. So many of them fascinate me, and with me not really going into any medical field other than support, I never gave this any thought in the past. After reading the list, I am more favorable of working for a neonatologist. It is difficult to think about how neonatologist physicians sometimes have the most difficult job in the world, but I can only imagine how amazing it would be to be a part of saving a baby’s life. I had a coworker once whose baby was born at 36 weeks, and her baby had a lot of heart and lung problems. There were concerns about whether or not they would ever fully develop once she had him, but after many months in the NICU, and many scares that happened during it, the doctors were able to save him and he is now a very healthy 5 year old. It is because of that I have a higher interest in the neonatologist field.I hate to say which type of physician I would care less to work for, and it is because I worry that many will take it the wrong way. When I was 16, I used to help my mom at an assisted living home as a caregiver. We would get to work at 7:00 A.M. every morning to prepare breakfast for four of the elderly men and women that we were caring for. We would then make sure that all bedding was changed, rooms were cleaned, meals were prepared, and appointments were handled. We worked 12 hour days, and they were always grueling. The owner of the home made sure that everyone had their medicine and made it to their doctor appointments on time. However, she was more worried about getting paid for her services than actually helping the elderly. She would yell at them if they did something wrong, and even call them terrible names. My mom reported her and we both quit our job, but it has always left a sting in my heart since then. It is because of my experience with that situation that I do not think I could ever work for a gerontologist. I know that the situations would be much different, but ever since my experience with caring for elderly individuals it is very hard for me to think about assisting a physician in geriatrics because I worry that someone else might treat the elderly in the same way the owner of the home did. I am a firm believer that the elderly deserve the ultimate care and comfort when going through any treatment and aging in general, but I do not think I could ever work in that environment again. I haven’t checked out the “lovely year of finishes” thing, but I know that I definitely take getting something done more seriously when I write it down, or especially if I admit to another person that I intend to get it done — then I feel more pressure to follow through. I would definitely like to make this a better year for accomplishing my goals. I just love that doll carrier — I’ll bet ViVi and Bea would make good use of that! It has totally helped me this year… I just jotted down a list on card stock with two sides, “big” goals and “small.” I have already checked several of them off and it has helped me so much! Its Empowering 🙂 Violet has three prototypes of the carrier, but she still keeps trying to swipe my final sample ! I just love everything you do! 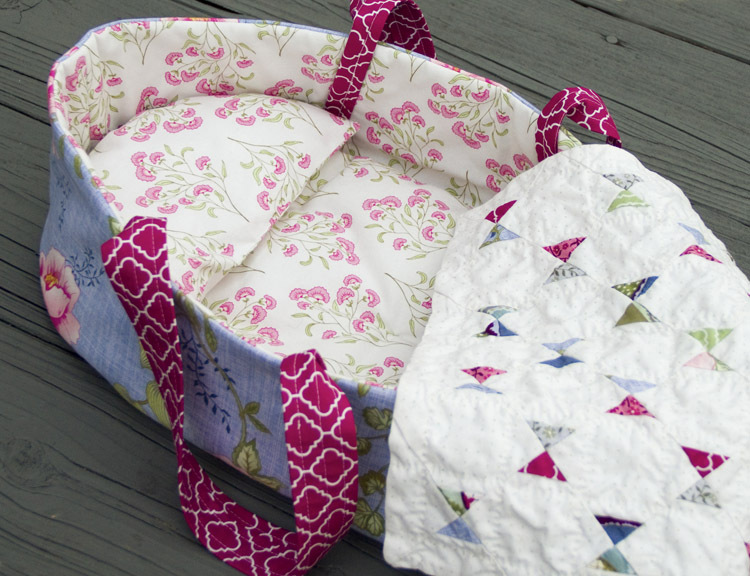 I love the Dresden Plate quilt and I love the doll carrier made from the Jasmine Tea and the darling quilt. I have a pattern I would like to sell on Craftsy but have not even begun the process. I’ll have to talk to you about it when we see each other this month! Thanks so much Linda! I keep telling myself that once I plow through all the hurdles of getting a first pattern out, the others will be so much easier! We will definitely have to discuss. What is your pattern for? A circular knitting needle holder. Jessie- that doll carrier and little quilt are so adorable! And I’m excited to see that beautiful quilt after you quilt it by hand! Thank you, Beth! I am excited to finish it! How exciting to write your own pattern! The doll carrier and quilt are quite clever. ha ha love the grey poupon video. love the dollie carrier, and will want to make one. get that on the net! you will be so glad, it is worth the effort. I love having my etsy shop. and your project is sweet. Did you use the EZ ruler to make your dresden? I just got one and it is fun! happy sewing.